To celebrate the recent home release of Night of the Comet on Blu-ray and DVD Arrow Video Club are holding a special screening of Night of the Comet at the Prince Charles Cinema this Thursday 16 October AND QA session with the star of the film (and many teenage's favourite crush) Catherine Mary Stewart !!!!!!!!!!!!!!! 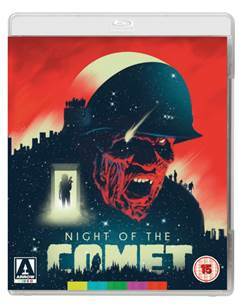 "Arrow Video is excited to announce the UK Blu-ray and DVD release of Night of the Comet, the 80s cult-classic which since its initial release in 1984, has gone on to amass a legion of loyal fans with its hugely entertaining riff on the apocalyptic sub-genre of movies, paying homage to such classics as The Omega Man and The Last Man on Earth. In fact this might be the most purely entertaining depiction of the aftermath of a catastrophic event, not just in movie history but possibly... well, ever." 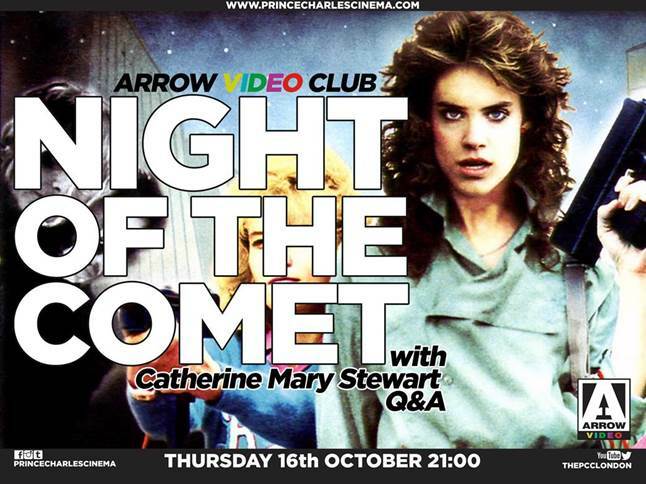 Arrow Video Club presents Night of the Comet & QA with Catherine Mary Stewart at the Prince Charles Cinema Thursday 16 Oct.
Life can be tough when you’re a Valley girl. First, there’s making sure you’re on time for pep squad practice. Then there’s having to live under the same roof as your bitchy stepmother who, you suspect, is making it with Chuck from across the road. And then, of course, there’s having to keep on the lookout for the occasional marauding zombie hungering after your flesh! A comet wipes out most of life on Earth, leaving two Valley Girls to fight the evil types who survive. Eighteen year-old Reggie (Catherine Mary Stewart – Weekend at Bernie’s, The Last Starfighter) misses out on the event-of-a-lifetime when she ditches watching the comet in favour of copping off with the projectionist at the cinema where she works. But this turns out to be a wise move when, the next day, she discovers that the entire population has been reduced to piles of red dust – leaving only Reggie, her sister Sam (Kelli Maroney – Fast Times at Ridgemont High, Chopping Mall) and a handful of other survivors to fend off the roving gangs of glassy-eyed zombies. 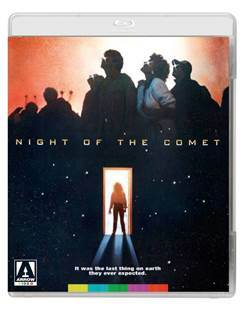 Taking its cue from classic “doomsday” movies such as The Day of the Triffids and The Omega Man (and with a healthy dose of Dawn of the Dead thrown in for good measure), Night of the Comet is an irresistible slice of Reagan-era B-movie fare which features Cyndi Lauper dance-alongs as well as some truly gravity-defying bouffant hairstyles… Well, it was acceptable in the 80s! 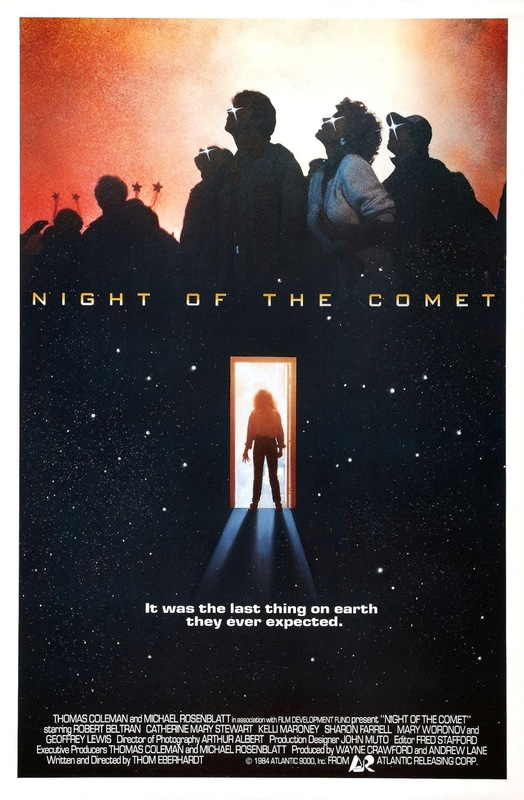 But what makes Night of the Comet stand out above its peers, would be its unique female lead characters, wonderfully played by Catherine Mary Stewart and Kelli Maroney. This is a film driven by its female characters. It is those characters who anchor the film, who give the film the heart which makes it so much more than a string of homages: the fun is balanced by the genuine emotional connection the audience develops with our heroines. Even if they have the occasional ditzy moment, this is a very genuine portrayal of two teenage girls and the film likes both of them far too much to mock. Although much of the surface details date it to a very specific era – the tinny synth ‘n’ saxophone music and that big hair!– the heart of the film still feels fresh because its two lead characters are so well drawn, so well played and so damn likeable. Intriguingly, for a film with such obvious antecedents, Night of the Comet has proved to be extremely influential, inspiring a number of other films which attempt the same trick of placing unlikely characters inside a foursquare genre format and sweetening the mix with humour. Most obviously, there’s Tremors (1990), in which a couple of good ol’ boys do their best to deal with an underground monster straight out of a ’50s creature feature. Writer/director Joss Whedon has professed admiration for Night of the Comet too, citing it as partial inspiration for Buffy the Vampire Slayer (1992 on film, 1997-2003 on TV). More recently, there’s Shaun of the Dead (2004). It doesn’t take much to see Night of the Comet as one of that film’s (numerous) influences, most obviously in the graceful juggling of comedy, character moments, and genuine genre thrills. Such things are only to be expected of a film with such a pronounced cult following. If it’s smart, witty handling of the genre was a little too sophisticated to meet with general approval upon original release in 1984, then it has ensured a strong afterlife, and its reputation continues to grow. Far more than ‘just’ a pastiche, Night of the Comet both celebrates the genre and contributes to it, updating the concerns of the golden age science fiction films for a new era and a new generation. Far more importantly, it remains thoroughly entertaining; and in an age like ours, when the world again feels increasingly apocalyptic (war, terrorism, environmental collapse... take your pick), such things are welcome indeed.